Home > Travel guide > What is special about Hanoi winter? In Hanoi, Vietnam, the winter is not too cold as Europe or Americas. With chilly weather and warm hearted people, Hanoi winter seems to attract many friends all over the world than ever before. 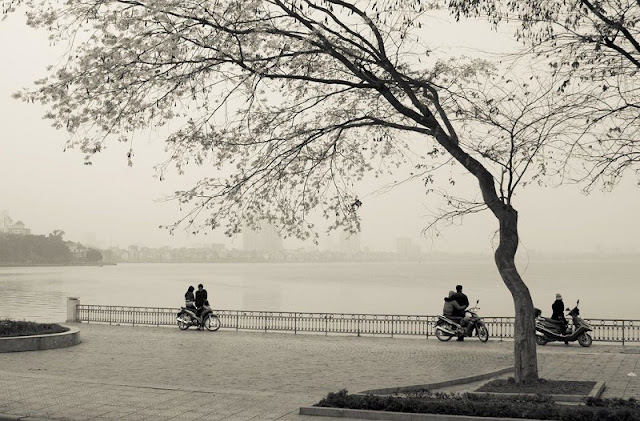 So, What is special about Hanoi winter? Let us explore the winter in the capital of Vietnam - Hanoi! The winter of Hanoi starts from December and may last until the February, with the average temperature of 15-17°C. Sometimes it drops to below 10°C and the high humidity will make the weather a little bit colder. Remember to bring warm clothes if you don’t want to get a cold when visiting a tropical country. Hanoi in early winter morning, the mist makes special beauty for the city. Somewhere people carrying bunches of flowers cycle slowly in the quiet air. Men prefer a hot cup of tea, sitting on the sidewalk evaporates, watching the flow of people back and forth. Hanoi young women walk downstreet in beautiful clothes. The children wear tightly when they are out, though only playing at doorstep. The old, with glasses of cold beer, talk about life. We can also catch the image of street venders struggling when it rains. Winter often brings a sad feeling, because the sky is often dark and gloomy. However, Hanoi seems to have its busiest days of the year and streets are more crowded than usual during working hours as people are in rush to complete all the remaining works and prepare for Tet holiday. The cold weather enables people living in Hanoi or visitors to enjoy the tasty hot food like hotspot or grilled dishes. The winter is one of many beauties of Hanoi. It’s worth coming and enjoying the atmosphere in Hanoi.